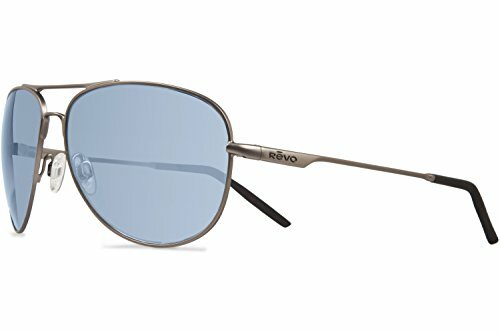 Timeless, classic and confident, the Gunmetal Frame, Blue Water 61mm Lenses Revo Windspeed sunglasses boast streamlined design with a slick aerodynamic appearance. Whether measured in knots or nautical miles, these sunglasses fit perfectly for days that start or end on the water. The Revo SurfacePro Protection System includes Revo exclusive mirror coatings, Revo Back-Surface Protection Coating, authentic Revo hydrophobic coating, and authentic Revo Oleophobic coating. The Revo exclusive mirror coatings has 3-6 layers of high-tech, performance mirror coatings based on NASA lens technology used for satellite protection and Revo back-surface protection coating. The authentic Revo hydrophobic coating is a permanent coating on the back of the lens that repels water and sweat while the authentic Revo oleophobic coating is a permanent coating on the front of the lens that repels oil and fingerprints. Revo Graphite Lens enhances natural vibrant colors while blocking strong rays and powerful glare. 6-base lens technology for a more flat fit relative to your face, making them prescription ready (rx-able). Revo lightweight, shatterproof, polycarbonate, high-contrast, polarized Serilium Lenses provide visual acuity in bright conditions. Crystal lenses are Scratch resistant, ground and polished to virtually the same standard as a camera lens. Made in Italy sunglasses with full rim aviator metal frame and plastic lens. If you have any questions about this product by Revo, contact us by completing and submitting the form below. If you are looking for a specif part number, please include it with your message.